You can achieve a smooth, close shave with a stellar razor and suitable shaving cream. A close shave gives a clean appearance perfect for making an impression at work or a looking fresh through all seasons. No matter what, you should never have to deal with cuts, rashes, or stray hairs when shaving. Of those two tools, shaving cream is a product people rely on every day. Despite regular use of it, few give careful consideration to what their cream is comprised of or if there are better options on the market. A little research can go a long way towards finding the best shaving cream. In a market flooded with options promising the best shave, finding the right shaving cream requires research to find the perfect fit. 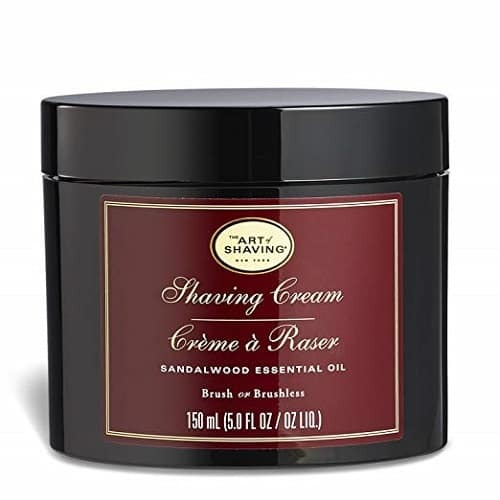 A great shaving cream is a protectant from abrasions. It also hydrates the skin for a warm glow. Whether you are cutting your beard altogether or just sharpening up your beard line, having the best shaving cream is essential. What Features Should The Best Shaving Cream For Men Have? 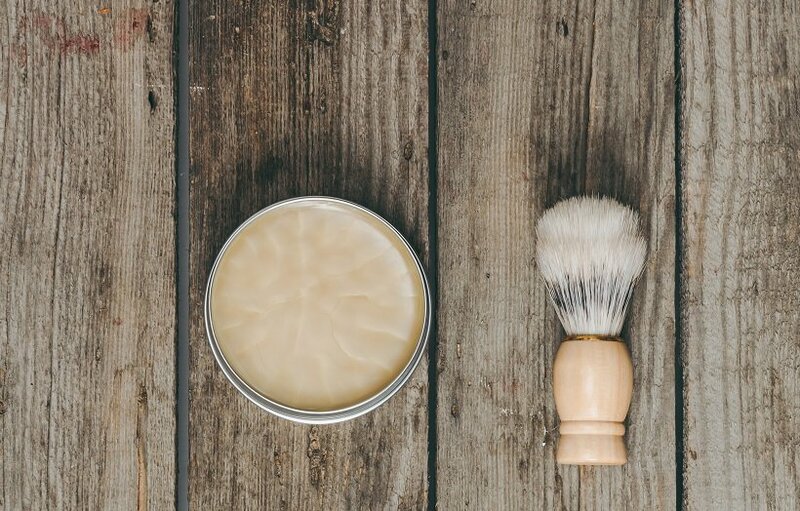 Before rushing into a purchase and committing to a shaving cream, you need to understand the features that the best shaving creams for men have. These will vary based on the individual, so know your skin before making a purchase. The best shaving cream for you will be based on your skin type. Skin type is typically sensitive, oily, or dry. If your skin is sensitive, avoid creams with astringents. Astringent-based creams are fine if you have oily skin because it will reduce oil and prevent clogged pores. Dry skin requires a glycerin-based cream to provide a foundation for the razor to glide across without causing nicks, scrapes, and cuts. What is in the cream will go a long way in providing a close, smooth and clean shave. As mentioned before, glycerin based products are suitable for dry skin. These ingredients should be avoided for a number of reasons, most notably because they strip away natural oils and cause irritation of the skin. Creams with fragrances typically use harsh chemicals, so they should be avoided. 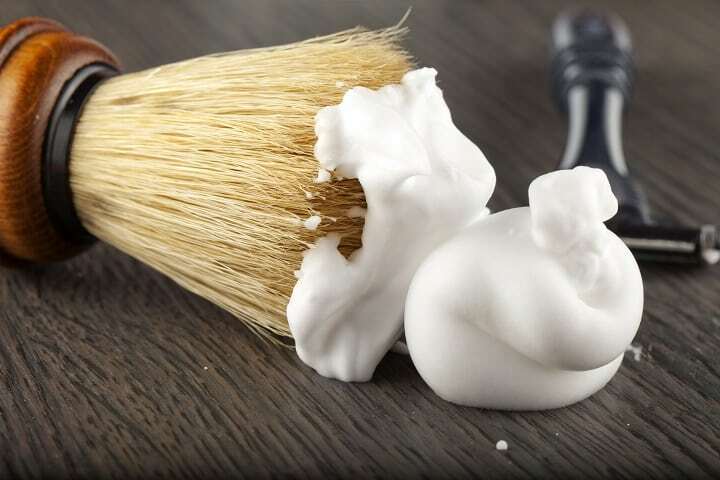 Shaving creams with natural ingredients and oils are much better for your skin. They tend to use oils like jojoba and almond that evaporate quickly without causing oily skin. Creams with essential oils leave a pleasant scent without being harsh on the skin. Some good essential oils included sandalwood, eucalyptus, lavender, and rose. A good shaving cream will balance miniaturization and pH balancing ingredients that help keep the skin smooth and feeling great after the blade has done its work. Shaving creams have a soap or detergent base, which can lead to dry skin. That’s why the additional ingredients, like glycerin, are so essential to keep the skin hydrated. How exactly does one choose the best shaving cream? When it comes down to it, the major factors in choice depends on you. What are your needs? What do you want from your shaving cream and how much do you want to spend to achieve it? Skin type and price are sometimes seen as the two biggest factors in choosing a shaving cream. However, it doesn’t stop there. In making this choice, conduct some research. Understand the ingredients on the label and don’t be afraid to consult experts. Seeking help lets you better understand your skin type. Shaving cream has been on the market since the 1940s and is a modern method to lather up the face for a shave. It comes in an aerosol can and releases straight onto your hand or face, ready to go. In terms of marketing and promises, companies tend to focus on the same aspects. These can be influential in making a buying decision. Shaving creams are not all scented, but that is an option if desired. As mentioned before, scented creams can cause skin irritation, especially for those with sensitive skin. The entire purpose of shaving cream is to provide a layer of protection for the skin before dragging a blade or razor against the skin. Some shaving cream requires little work to adequately lather with top rated shaving cream warmers and spread across the skin. A great cream will provide more than adequate lather for protection, cushion, and lubrication. Shaving creams come in a variety of prices with some high-quality options coming in around $30. Other brand name products can be secured in the $10-15 range. The size of the can itself can help in deciding if the price versus quantity is adequate for your needs. Just as all razors are not created equal, neither are all shaving creams. With so many different types of razors on the market, including dual edge safety razors, it is understandable that not all shaving creams will be compatible with every type of razor. Diving into product reviews can let you know if the potential cream will match up with your preferred razor. Another option is to prioritize the cream first and then find a razor to match it, often times in the form of a safety razor vs cartridge razor. If you prefer a durable shaving shavette, you’ll need to find to do some research to find the best cream. As mentioned before, some creams are produced in small quantities for a more artisan market. If you find a great local shaving cream and then travel frequently, you might find it difficult to restock. If it is only available online but you prefer to purchase in-store, you might want to look at your local mall. Knowing how and where to get your hands on a product is essential when choosing which cream to commit to. You can find lubricant options in the form of hard soaps, lathering creams, non-lathering creams, and gel. Each has its own pros and cons and can be worth testing out to see if it is a right fit for you. Hard shaving soap has been around for centuries. Shaving soap provides extra moisturizing effects and can be worked into a rich, dense lather. A shaving brush is really helpful when using a hard soap. This is the more common shaving option that we are focusing on here. These days, the creams come pre-mixed with water, glycerin, and oil which allows for immediate use without working into a lather. This is a type of cream that provides a shave without all the work-up. They use similar ingredients to the lathering shave cream minus the ingredients that cause it to foam up. The name is misleading because these creams can still lather, and some rather well, but they also spread without the foaminess of other creams. Both creams and soaps are designed with the same outcome in mind but are still completely different products. Understanding the differences between the two will be an important step in choosing the best product. Shaving soap has been around for centuries and is the traditional wet shaving method. It comes in a disc or puck and is meant to be used in a shaving bowl. The form itself is the main difference between the two. Unlike shaving cream, you’ll need water in order to build up a solid lather to begin shaving. Shaving soap gives a unique kind of shave because it is the old-school approach. Because of this, it does mean you’ll have to learn a different type of grooming process. Shaving soaps come in around the $10 to $15 range, mirroring most standard creams. Just like cream, gel comes in a can. Unlike cream, the gel has to be worked into a lather, but that only takes seconds. Experts put gel over cream when the user has sensitive skin. There are sensitive skin options on the market of shaving creams, but the gel is also great for that particular skin type. You’ve probably got a pretty good idea what you need from a shaving cream at this point. 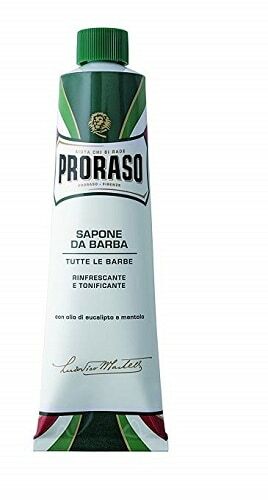 It doesn’t matter if your skin is oily, normal or dry, Proraso Shaving Cream works perfectly well for every skin or beard type. Eucalyptus oil and menthol are encharged for purifying, refreshing and revitalizing your skin during the shaving process. You will also find glycerin on the list of ingredients. Glycerin is precisely the ingredient that plays a significant role in helping the blade glide effortlessly across your skin and reducing the possibility of razor burns and rashes. When you apply the cream on your face, it will form a nice, rich and thick lather and help you have a close and comfortable shave. The skin will remain soft and hydrated in the process because this product doesn’t contain parabens, silicones, phthalates and other artificial ingredients. The first thing you are going to notice when shaving with The Art of Shaving Cream is its extremely rich and foamy lather that works like a dream in protecting and hydrating your skin. This product also makes a beard softer, making it easier to have a close and comfortable shave with no razor burns or irritation. Because of its thick consistency, you’ll need just a small amount per every shave. This and the fact that it comes in a big tin means your cream will last for a very long time. Glycerin and coconut oil, mixed with essential oils make the skin feel smooth and moisturized after every use. In addition, the sandalwood scent is amazing without being too strong so you can combine it with your favorite beard oil or balm. 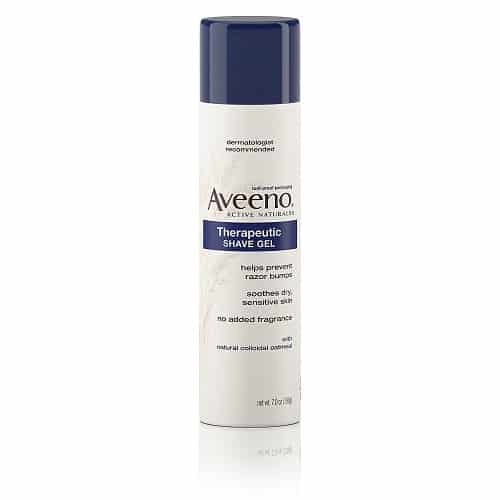 Infused with natural oatmeal that’s very soothing to the skin, Aveeno Therapeutic Shave Gel is effective in hydrating and protecting the skin against razor bumps. While shaving, it moisturizes your skin to keep it hydrated and reduce chances that you cut yourself. Usually, men with sensitive and skin that gets easily irritated are the ones that have most problems when shaving. That’s why they will find this product especially useful, providing that it was crafted mostly for these types of skin. The formula will give you a close, smooth shave without irritation every time. Coming in one of the biggest bottles of 7 oz, this shaving gel will last you for a long time, although you might find it that’s more on the expensive side. 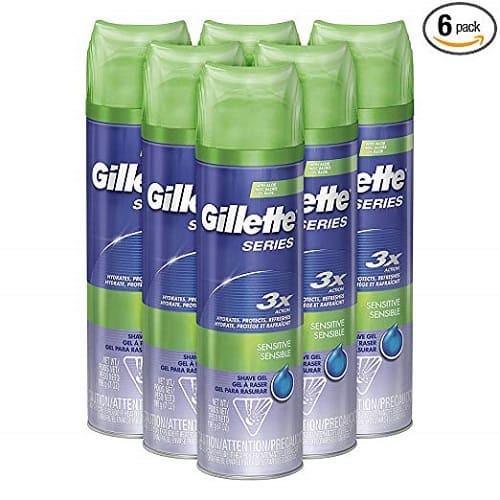 Well known three action formula of Gillette Series Shaving Gel has shown amazing results in hydrating, refreshing and protecting your skin from irritation during shaving. It’s no wonder that this manufacturer is one of the few whose name pops out first when it comes to shaving products. That’s also the case with its shaving gel formulated with aloe to help protect sensitive skin against redness, nicks, cuts, tightness, burning and stinging sensations. The gel lathers up, spreads and rinses very nicely. It also doesn’t come with a too strong smell, so you can combine it with cologne. Although it’s not made of all-natural ingredients, for a pack of six large cans, the price is a bargain deal. 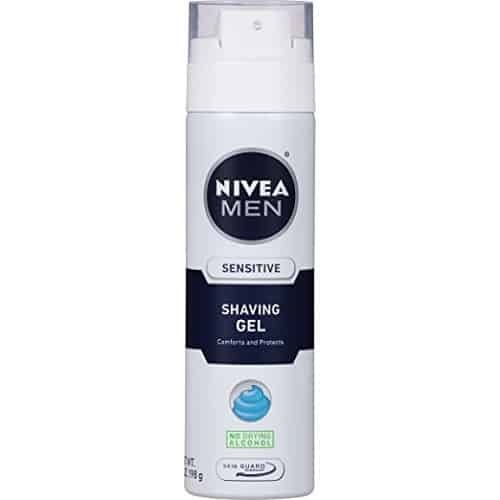 Improved, aloe and chamomile based formula of Nivea Men Sensitive is extra gentle, so it’s the best choice for men with sensitive and easily irritated skin. It produces the extra thick lather that creates a protective barrier between your skin and the razor to give you a closer and smoother shave. Because aloe soothes the skin and moisturizes it, you won’t have problems with razor burns and other skin irritations. The result is a smoother and healthier looking skin. Providing that for the price you get three tins that are all 7 oz, this product will last you for a long time. There are two things that you can see as downsides. A lot of customers find the smell overpowering and also have problems with a nozzle that always releases more gel than needed. 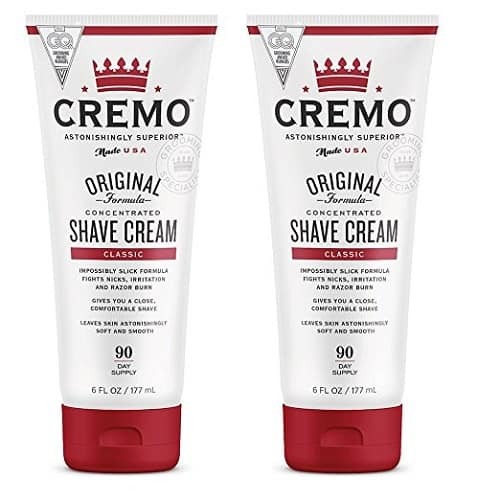 What separates Cremo Shave Cream from similar products is the fact that you activate it with water. Just a little amount of cream will suffice to shave your whole face. You don’t want to use too much and make the product too watery. When a proper amount is used, this cream will form an ultra slick surface, so you can glide a blade across the skin almost effortlessly. Because of this, there will be no razor burns, nicks and irritation and your face will feel smooth. On the other hand, you’ll enjoy a close and comfortable shave. Although it’s made with natural ingredients like macadamia seed oil, calendula, lemon, papaya, olive leaf extract and aloe vera, this product’s not good for sensitive skin. 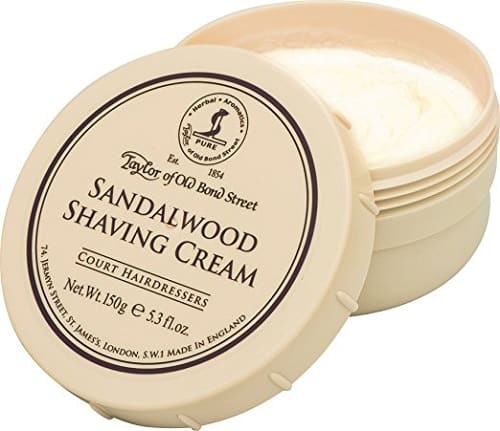 Moisturizing and preparing your face for shaving is something Taylor of Old Bond Street Shaving Cream does exceptionally well. It lathers pretty quickly and becomes super thick, without the need to apply too much. You only need a small amount for the full coverage. This lather will protect your face from nicks, rashes and irritation while giving you a super close shave and leaving your skin soft and smooth. As it’s already mentioned, a little goes a long way, so you will get a whole lot of shaves out of one container. The product also has a great sandalwood scent, which a lot of customers have noticed. However, the smell is very strong and lingering, so you might find this a downside. This section might seem redundant, but shaving is an underappreciated art form. Once a quality shave cream is selected, you’ll want to be sure you are using it right. The correct approach ensures a shave free of irritation and a close, clean result. The obvious method of using cream is to apply it with your hand. Place a small quantity in each hand and rub them in small, close circles. Apply it evenly across the area and strive to avoid clumps. It is recommended to shave right after showering. The heat and moisture from the shower will help prepare the hair follicles for the shave. Another option is to use a shave brush. A shaving brush comes in different fibers and requires mixing cream in a bowl. Mix the cream to the desired thickness and texture, potentially adding a little water. You’ll then swirl it with the brush and form a rich lather. After applying water to your face, you’ll use the brush to spread the cream. The brush lifts the hairs on your face and makes it easier for a blade to cut down the hair. Overall, it can lead to less irritation, nicks, and cuts. A shaving brush allows you to spread the cream evenly across your face. A great shaving cream is just one step in achieving the perfect shave. There are other tools and tricks to a great shave. Some of those include the razors, which has an entire market on its own too. Just like shaving cream, finding the best razor for shaving your head means conducting research on what suits you. Research topics include everything from finding the best shaving razor for sensitive skin to safety razors vs cartridge razors or even dual edge safety razors. If you are just trimming a well-kept beard, you’ll need tools like the top selling beard oils. To learn beard shaping tips seek out a professional beard shaper. They can even provide secrets about how to grow your beard faster! If all that seems overwhelming, you can get everything you need by looking into favorite beard grooming kits. Overall, there’s a lot more to choosing a great shaving cream than just a quick scan in the personal care aisle. There are nuances between ingredients, prices, brands, and other factors that all weigh into what a perfect cream is. While this guide isn’t all-encompassing, it is a great jumping off point into even more beard care and shaving knowledge. From high-end creams to economical options, finding the right fit is all about understanding your needs and how a shaving cream can help you achieve the look you want. Photos from: hquality / depositphotos.com, Koufax73 / depositphotos.com, Goodluz / depositphotos.com, AntonMatyukha / depositphotos.com.